As the east coast (and the rest of the country) heat up, keep your dogs cool. 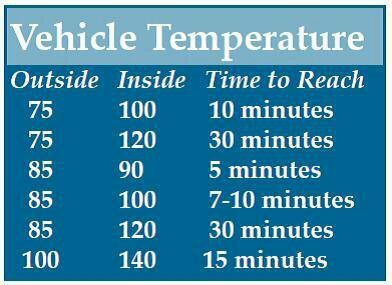 We know you’ve been told to never ever leave a dog in a hot car, but we don’t always think it’s as hot as it really is. And we also don’t think we’ll take as long as we usually do. Honest mistakes happen, even when we mean well. Just please don’t take the risk, and keep this at the top of your mind. If you find yourself with the need to do this, please, ask for help. You will be surprised how many people will step up. If you don’t, do not be angry if you come back to find your window broken. Someone was trying to save a life. Kiddie pools are great. Use the plastic ones since the blow up ones will pop with nails! Don’t fill up the kiddie pools. You want to make sure they can lie down, submerging their bellies, but not their heads! Garden hoses are good too, but remember to check the water from the hose because in the heat, it comes out hot!! Make sure there’s an area in the shade they can cool off in, and keep that area dry. Just freeze some cups and pop them out to give them something cool and refreshing to chew on. Freeze a mixture of water and plain vanilla yogurt, and give them cheap special treats that are good for them. Wet and freeze towels in freezer bags and roll out for them to lie on. Always make sure they have plenty of water, and change it regularly. Keep their water in the shade and keep it cool. Be careful when walking them, especially on pavement. You’re wearing shoes, they’re not and the ground heats up pretty quickly. Hang out with them. It’s hot, but they still like the attention. Remember, never EVER EVER leave a pet in a car, even with the windows cracked. Cars heat up very quickly and your pet can die in a lot less time than you think. It’s not worth it! Ask for help if you feel you don’t have a choice!! !